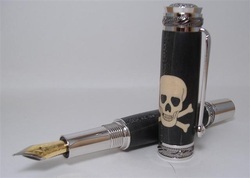 Looking for the ultra special pen for your passion or person? Then look no further! 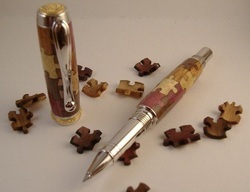 The below specialty pens are created from pieces of wood that are laser cut then hand assembled and available in a variety pen style to fit your needs. If you don't see exactly what you need, just ask. The Click-Stache features simple lines and details, high quality Rhodium plating, one-handed click action, and takes a standard parker style ball point refill. 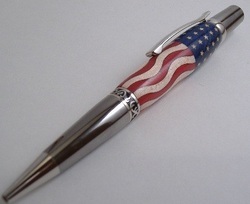 The body of the pen is made from a hardwood called Holly, and the mustache itself is made from dyed maple. Ask about adding custom crystal eyes to your pen. like in this Renaissance below. Choose between dyed green or natural wood at time of order, if you don't pick I will! Please note the color you would like at the time of order.